Robert Shiller is a professor of economics at Yale and the bestselling author of Irrational Exuberance, in which he predicted the collapse of the stock market. He was also one of the first economists to accurately foresee the devastation that would follow the subprime mortgage crisis. In Animal Spirits: How Human Psychology Drives the Economy, and Why it Matters for Global Capitalism, written with George Akerlof, he argues that today’s markets are as much driven by human psychology as by finance. Shiller uses the idea of “animal spirits,” a term invented by revolutionary economist John Maynard Keynes, to describe the powerful effect of human emotion and confidence on the economy, and to push for more government intervention and bigger stimulus packages in the U.S. and Canada. President Obama's National Economic Council head Lawrence Summers noted in his speech March 13 that the economic crisis has led to an "excess of fear" that must be reversed. To understand the role fear plays in the current crisis, we must understand the role of human psychology. John Maynard Keynes thought psychology was the major cause of economic booms as well as busts, though this aspect of his work is now largely forgotten. He said people's economic decisions, in both good times and bad times, are largely, ultimately, if indirectly, driven by animal spirits, primitive psychological tendencies. In 1934, the journalist Johannes Steel wrote a remarkably prescient book, “The Second World War,” which described the social psychology that laid the groundwork for global tragedy. Mr. Steel was trying to peer into people’s minds and infer their actual world views and motivations — in part by examining prewar cycles of social provocation in Germany and Japan and Italy. His timing about the war was wrong — he expected it to start in 1935, not 1939 — but he was correct about many fundamentals. Yet his early readers were often skeptical and blithely assumed that there would be no war. 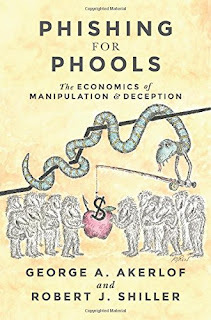 So it has been with more recent analyses, based in large part on social psychology, foreshadowing the global economic crisis of the current day. No one got it exactly ight, but the insights of the approach exemplified by Mr. Steel and used by some nalysts today are worth taking very seriously. Shiller Lecture: "Animal Spirits: How Human Psychology Caused the Current Economic Crisis"
Economist Robert Shiller delivers the first annual Beattie Family Lecture in Business Law at the Faculty of Law at The University of Western Ontario on March 27, 2009. Prof. Shiller spoke on "Animal Spirits: How Human Psychology caused the Current Economic Crisis." A video of the full lecture is available through ITunesU and YouTube.